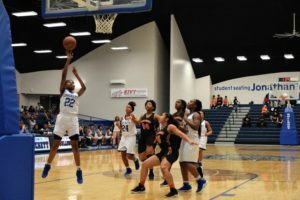 CROCKETT – As the final few games in District 20-3A competition got underway on Friday, Feb. 1, the Crockett Lady Bulldogs held a one game lead over the Westwood Lady Panthers for the fourth and final playoff spot. The two teams hooked up last Friday in a game with serious playoff implications. A win and the Lady Bulldogs were in the postseason. The Lady Panthers, on the other hand, were in a must-win situation. A loss and their playoff hopes were over. A loss by the Bulldogs would not eliminate them from playoff contention but it would put them in a wait and see mode. From the opening tip, it appeared as if the Lady Panthers simply wanted it more as they jumped out to a 16-13 first quarter lead. Jordan Carter paced Westwood with seven points while Monica Wilson had five and Tommiana Calhoun had four. Shabess Johnson put in five first quarter points for the Lady Bulldogs while Jaida Lockhart had four. Katelin Holmes added three and Tynaisha McKnight had one. As the second quarter got underway, Crockett’s shooting went ice-cold from the field. Holmes scored six and Johnson added one, but that was it for the Lady Bulldogs in the first half. Shabess Johnson puts up a shot during first half action of the Crockett Lady Bulldogs game against the Westwood Lady Panthers. The Lady Panthers won the contest by a final score of 60-41. The Lady Panthers, meanwhile, used the Crockett shooting woes to their advantage and opened up 34-20 halftime advantage. Wilson knocked down six for Westwood while Carter had four. Tori Stephens hit a three-pointer while Tiana Davis and Tia Hatten both had two. Calhoun converted one of two from the line to close out the first half scoring. After the break, the Lady Bulldogs attempted to make a comeback but the Lady Panthers were having none of it. Carter and Wilson both had six, Davis and Hatten both had three and Calhoun added two as the Lady Panthers opened up a 54-31 lead after three quarters of play. Crockett’s third period points came from Jaycee Parker with four, Johnson with three and both Alinjah McKnight and Lockhart with two apiece. With a 22-point lead and eight minutes left to play, the Lady Panthers milked the clock as much as they could and only scored six points in the fourth on twos from Carter, Hatten and Wilson. Try as the might, the Lady Bulldogs could not take advantage of the stall tactics. While they shaved a few points off the lead, the deficit was too much for Crockett to overcome. A. McKnight had three, while Holmes, T. McKnight and Chelsea Walker all had two. Lockhart made one of two from the line to wrap up the Crockett scoring in the fourth period as the Lady Bulldogs fell to the Lady Panthers by a final score of 60-41. On the game, the Lady Panthers were led by Jordan Carter and Monica Wilson with 19 points apiece. 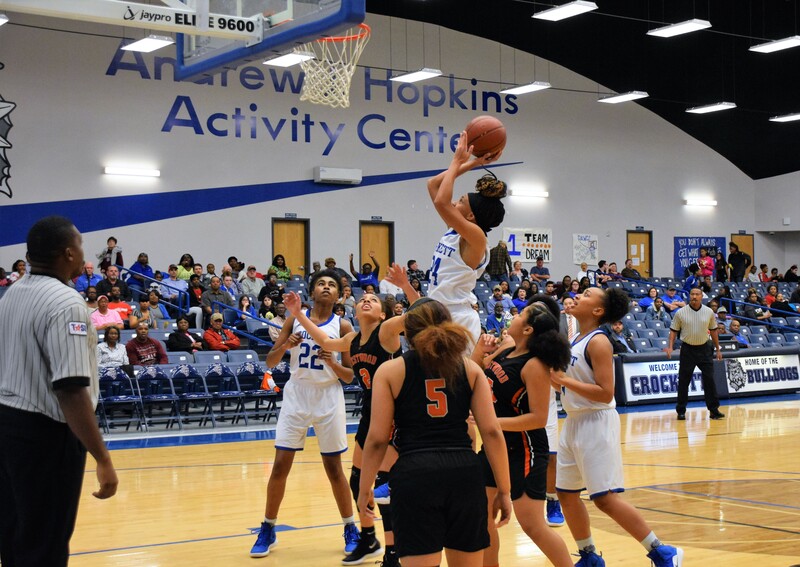 Tommiana Calhoun and Tia Hatten both had seven, Tiana Davis dropped in five and Tori Stephens had three to close out the Westwood point production. The Lady Bulldogs were led in scoring by Katelin Holmes with 11 and Shabess Johnson with nine. Jaida Lockhart added seven, Alinjah McKnight went for five and Jaycee Parker had four. Rounding out the Crockett scoring, Tynaisha McKnight had three and Chelsea Walker added two. The loss means the Lady Bulldogs will finish the District 20-3A season with a record of 6-6. Just ahead of Crockett, the Frankston Maidens are 6-5 with a game on Tuesday against the Teague Lady Lions. Expect Teague to win and send Frankston to 6-6. Westwood finishes district play on Tuesday, Feb. 5 against the Elkhart Lady Elks. Expect Westwood to win that matchup and move to 6-6. That means Crockett, Frankston and Westwood will all finish tied for third with 6-6 records. With two spots left in the postseason, someone is going to be left out. The scores of Tuesday night’s games were not available as of press time.